Dhaka, 5 May, Abnews: A day after former Australia skipper Steven Smith thanked the public for their support, David Warner too spoke about the unprecedented support he has received in the aftermath of the unceremonious ball tampering scandal which unfolded in the Newlands Test in Cape Town earlier this year. Both Smith and Warner, who were part of the leadership group that hatched the plan of using a sandpaper to alter the condition of the ball to aid reverse swing, were banned for a period of 12 months while Cameron Bancroft who was in the eye of the storm was suspended for nine months. All the three players upon landing in Australia had broken down in front of the Australian media and pleaded guilty for their wrongdoing. On Thursday (May 4), Smith echoed his thoughts about how his family and fans had been thoughtful in their support for him and that he had a lot to do to earn the respect of the public back. Voicing the same feelings, the disbanded left-handed opener mentioned how in the most testing times, he’d been well supported by the society. 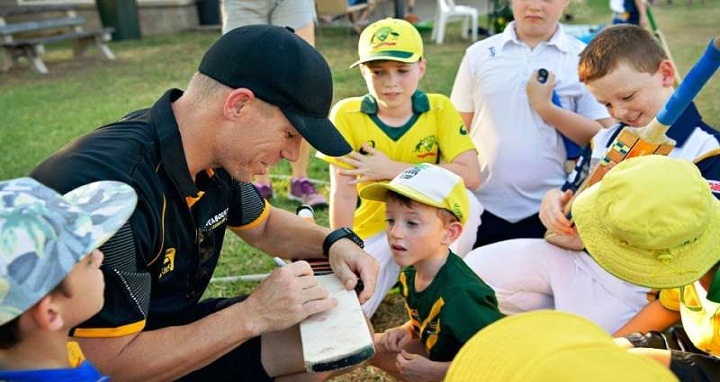 Intermittently, videos and pictures of Warner have emerged on the social media showing him playing with his kids in the backyard and spending time with his family. “I think the biggest thing for us has been when you are in a routine you can get caught in a bubble – cricket, hotels, packing your bags, coming home. You are not home for long,” he said. “With an extended period of time you are in a good routine but then it is selfless – kids are a priority – so it’s day care, swimming lessons, gymnastic lessons and then you get your quality time together as parents.